List your products quickly by importing your saved Scoutify Buy List or one you created! Click here for information on creating a Buy List in Scoutify. List price must be entered, and it must be greater than zero, or it will not import. If the Buy List contains any formatting errors, a Buy List Validation Error window will be displayed. It will contain the issues that you will need to fix before you can proceed. Notice the Workflow Type has been automatically set as Private. This is the default workflow type for a batch that includes imported product listings. Make the appropriate selections for the remaining batch configurations (e.g., Ship From address, Packing Type, Box Content activating/deactivating, etc.) and click Process Buy List. Next, the screen will appear allowing you to select the corresponding columns with the file you are importing. If the .CSV file was created using our mobile application, Scoutify 2, then these options will automatically be selected for you. ASIN, Quantity, and List price are the only required columns. A green popup tells you your Buy List is now being processed. When complete, you’ll be advanced to the final validation steps before creating your batch. If your Buy List is not processed successfully, double check that your .csv formatted spreadsheet includes a List Price greater than $0.00 for each MSKU. Save your file and import again. Importing into an existing batch is easy! Click on the 3 line menu next to the batch you’d like to import into and select the + Import BuyList option. Locate the saved .csv file on your computer and select OPEN. Next, you'll move on to the column mapping screen as seen earlier. When your Buy List has been processed, you will still receive a notification that your file is being uploaded. You'll also be notified when your items are being added to your batch. When complete, you’ll be advanced to the final validation steps. The products included in your Buy List have now been validated by InventoryLab. Your inventory is listed below the column headers and they are color coded. GREEN product listings have been successfully added to the batch. GRAY indicates a product has been removed from the batch. Track any remaining product alerts at the lower left corner of the screen. In this example, 106 MSKUs were successfully added to the batch, four require further action, and two products were removed. The display will update as action is taken on the four listings in red. Any steps required before an MSKU can be added to the batch appear in the Action column. The batch includes a duplicate of this MSKU. Click the Merge Duplicates button to merge the quantities of the duplicates into a single listing. This will apply the accounting data of the first cost per unit, supplier, and purchase date entered within the list. 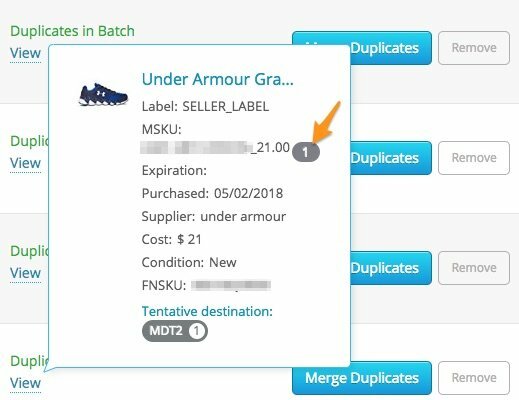 When importing into an existing batch, the quantity of the original item will update to include any duplicates you select to merge. You’ll even have the option to see how many you already have in the batch before merging additional quantities – just hover over the View option. If you have the 'Automatically print label on quantity edit' box is checked in Settings>Print Settings, additional labels will print only for the quantity that is added to the batch. If you have two issues that are the same product, as shown below, you address each one separately. You can merge one and remove the other, or remove both or merge both. If necessary, you can also REMOVE one or all of the duplicates. Removing an MSKU will cause the product listing to appear in gray and an option to Undo the Removal will appear. Select Undo the Removal to add the MSKU back to the batch and take the required action. Click the Choose Child ASIN button and select the appropriate product variation. 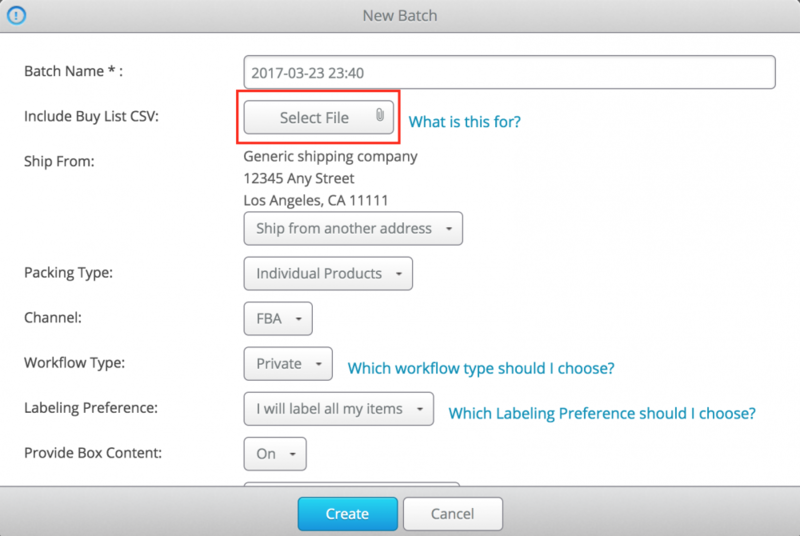 The batch includes a product InventoryLab recognizes as already existing in your inventory. Click the Replenish button and choose to use the existing MSKU or a new MSKU. Click here for additional details about replenishing a product in your inventory. If a batch has more than two items that are being replenished, you can do this in bulk by selecting the Bulk Replenishments Options button. By clicking “Replenish All”, this feature will automatically use your existing MSKU if there is only one option available. If there are multiple MSKUs to choose from for a particular ASIN, a pop-up will appear allowing you to select the MSKU you wish to use. The “Ignore All and Use New MSKUs” option will generate new MSKUs for those items based on your Variable MSKU Settings in InventoryLab, unless you have included an MSKU in your buy List. In this instance, the MSKU included in the buy list will be used. The “Delete All and Use New MSKUs” option will delete the listings in both InventoryLab and Seller Central completely for those items and generate new MSKUs based on your Variable MSKU Settings or the MSKU included in the buy list. Note: Once deleted, this cannot be undone! If you have many items that need to be replenished, you can choose to do some manually and then bulk replenish the rest, as well. A green popup appears letting you know that Amazon is in the process of validating the products in your Buy List. Once the validation has been completed, you'll see the following message and will be able to move forward with creating your batch. However, if Amazon identifies an issue or needs more information about a product, you will need to take the required action before you will be able to create your batch. Amazon requires updated dimensions for a product in the batch. Click the Add Dimensions button and enter the appropriate information. A green popup will let you know the dimensions were sent successfully. Note: Once the dimensions are added, it can take up to 15 minutes for Amazon to accept them. They will appear in your batch with the ‘Check Status’ button. Once the dimensions are accepted and you click this button, it will disappear and the items will be effectively added to your batch. For more information on this, take a look at this help article. If it is taking some time for the dimensions to be accepted, you can add them using this workaround. If you’d rather not enter the required dimensions you can also choose to REMOVE the item entirely. A Dimensions Alert is the only actionable issue in the Amazon Validation process. Any other issues found by Amazon will automatically add the product to the Removed MSKUs total and the listings will be greyed out. These include Restricted or Hazmat items. With all of your MSKUs validated by InventoryLab and again by Amazon you’re able to advance to the final step by clicking the Create Batch button. A green popup lets you know the process of creating your batch has begun. When complete, the products included in your imported Buy List are added to the batch and are now displayed on the List>List & Prep screen. You can manually add additional products to the batch, import another buy list to add to the batch, or move forward in the process by Creating Shipments and entering your Box Content Information. Keep in mind, if you try to exit the screen before finishing the import process, you will receive a warning message warning you that you will lose your progress to this point and will have to start over. So it is very important once you start that you complete the import process. If you want to create your own buy list to import, we have also made that option available.